Have you been looking for a new hobby to lighten up cozy, long winter nights? Maybe, a new craft to help curb anxiety and ease depression? Easy and simple knitting projects may be just the right answer for you, according to science. Creative people are just happier! Maybe, you just became a grandma and would like to create an heirloom piece for a grandchild to cherish for many years? Look for an easy baby blanket knitting pattern many of which are suited for beginners and be amazed how quickly you can create something unique for your beloved grandchildren. If you don’t feel comfortable learning knitting then try crochet! Just take a look at this step-by-step tutorial on how to crochet a baby blanket. Learn a few basic stitches and you will be creating your own designs in no time at all! As it turns out, knitting can elevate your spirit and keep your brain healthy, as it has been proven by numerous scientific studies. Many crafters who picked up knitting needles for the first time or are trying to return to their roots and recall some cool knitting patterns taught by grandma are amazed how quickly this age-long craft has become a vital part of their lives. It has been long-recognized that activities that involve your hands and brain, such as knitting, crocheting, weaving, and quilting, have a therapeutic effect both on your body as well as emotional well-being. A study of 3,500 knitters worldwide has shown that 81.5 percent of respondents rated themselves as feeling better and happier after knitting. According to Dr. Alton Barron, knitting can prevent arthritis and tendinitis – two serious conditions that plague seniors and prevent retirees from enjoying their golden years. Together with his wife, Dr. Carrie Barron, a psychiatrist, Alton Barron authored a book “The Creativity Cure: Building Happiness With Your Own Two Hands.” Carrie, a skillful knitter herself, credits needlework for alleviating depression and anxiety, without pills and side effects. And you don’t have to be a pro to experience these benefits of knitting – for beginners using basic easy knitting patterns can be as therapeutic as for advanced knitters working on a complicated project that requires advanced skills and deep knowledge of complex or unusual knitting patterns. The mathematical nature of knitting and rhythmic repetitive motions by your hands keep the brain 60 percent occupied with healthy meaningful activity. In a way, knitting is an escape from problems of every-day life when the brain may rest from stressful thoughts. “People basically have a vacation from their problems,” says clinical psychologist Ann Futterman-Collier who runs the “Well-Being Lab” at Northern Arizona University. He calls it “Textile Therapy” and points out to the numerous emotional benefits of knitting, as well as crocheting, weaving, and quilting. It is interesting that people who actually created something with their own hands experienced less of an inflammatory response when facing a stressor. Knitting also proved to be beneficial for those who suffer from panic attacks and anxiety. Betsan Corkhill, a licensed physiotherapist, explains that by “using an awful lot of brain capacity to perform a coordinated series of movements, you curb anxiety attacks.” “The more capacity you take up by being involved in a complex task, the less capacity you have for bad thoughts,” explains Dr. Corkhill. A small study of patients with eating disorders found that taking knitting lessons had a positive effect on them as well. Keeping a mind occupied with creative activity reduced obsessive thoughts and behaviors. A study by the Occupation, Participation and Health Journal cited the benefits of needlecraft in blocking negative thoughts, calming effect of repetitive motions, and providing opportunities for socializing in knitting groups and creative circles of like-minded enthusiasts. Knitting has been making a comeback in recent years. Pointing out craft’s palliative effects on the mind, knitting has been called the “new yoga” for good reason. Praised for its relaxing, meditative qualities, knitting has been successfully used in hospitals, clinics, schools, and even prisons to help people lead healthier and happier lives. Many beginner knitters who picked up the craft for therapy, have credited it for much more than just curbing anxiety. “Knitting saved my life,” says Liat Gat, who runs the video instruction site KNITFreedom.com. Admitted to a clinic with a life-threatening eating disorder, Gat, a lapsed knitter, picked up knitting again when a craft volunteer offered yarn and needles as part of therapy. Soon she had numerous advanced and simple knitting projects going and was giving other women lessons and helping beginners to fix mistakes in their knitting patterns. Within weeks of starting to knit again, she was out of the clinic and working at a yarn shop. The recent study by Mayo Clinic professor of neurology and psychiatry Yonas Geda involved over 1,300 seniors 15% of whom had a mild cognitive impairment which can later lead to dementia. The research has proven that those involved in crafting, knitting, playing games, and computer activities were 30-50% percent less likely to have a progressive cognitive impairment. The science behind this phenomenon was described by Dr. Geda as building “cognitive reserves and the ability to buffer and withstand lots of assault by bad chemicals” attacking our brains as we age. These studies point to the same conclusion as the research done on mice: animals living in rich and complex environments and being stimulated by toys and activities are less likely to develop dementia and Alzheimer’s disease. But why concentrate on knitting in particular if you are looking for something to relieve stress and curb anxiety, as well as keep your brain young? There are many theories, some coming from renowned psychiatrists, brain specialists, and occupation therapists. Once a beginner knitter has mastered techniques (and there are only 4 basic stitches to learn), the rest is just repetition. And these repetitive knitting movements is what can put the body in that coveted elusive relaxation state when breathing slows, heart rate, and blood pressure fall, and levels of stress hormones drop. According to psychiatrist Teresa Anderson, knitting and crocheting can be beneficial for patients suffering from PTSD, anxiety, and major depression. Dr. Anderson points out: “People recommend meditation, which is nice in theory, but some people are so worked up they can’t sit still long enough to meditate.” She calls knitting “active meditation” – something you can focus on and perform with your hands while its repetitive quality provides stress relief. An online community of knitters and crafters is an impressive force of 38-million passionate participants who exchange knitting patterns, post their best knitting projects on their blogs, offer their knitted creations for sale, and film their own Youtube knitting tutorials. There are numerous free knitting patterns for beginners and helpful e-books to get you started. Consider something small if you are a beginner, like knitting an infinity scarf (there are tons of free scarf knitting patterns) – there is something magical in picking up needles and thread and creating a unique product that you can touch, use, and give as a gift to your friends and loved ones! Is there a new baby in the family? 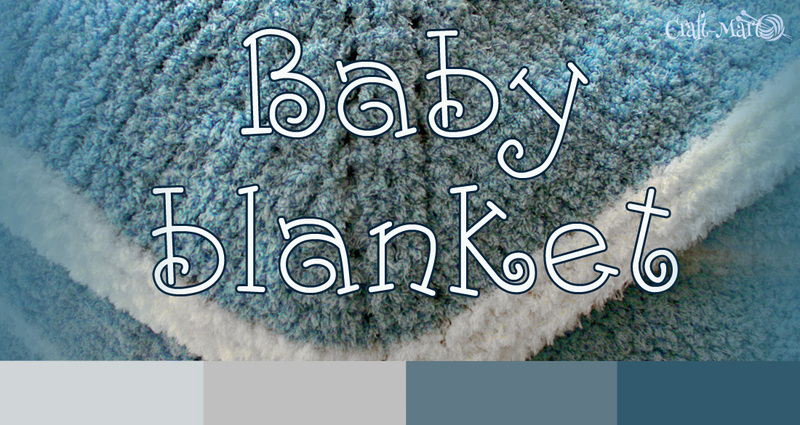 Pick one of the easiest baby knitting patterns and create a baby blanket as a baby shower gift. Transform your home with one-of-a-kind throw, pillows, and decorative touches. Create matching Christmas stockings to decorate your mantel. Possibilities are endless with many exciting and surprisingly simple knitting projects. And while you are knitting them, reap some health benefits. That old saying: “Idle hands are the devil’s workshop” gets a new meaning with crafts: hands that are busy knitting and crocheting might be a powerful workshop for positive thoughts that feed your brain and reduce stress hormones. 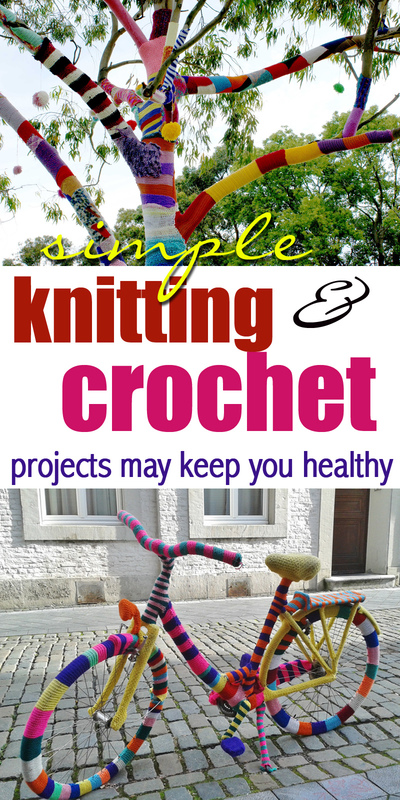 Would you like to try simple knitting projects? We have easy step-by-step tutorials to get you started.